Confessions From A Stay At Homo (SAHM): Introducing Patek Palin! Many of you inquired about the new dog popping up on the blog. 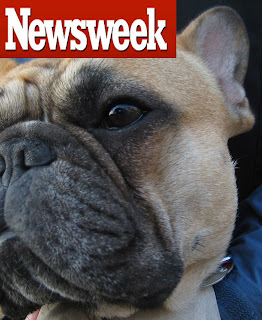 He is FRM#1's new pet French Bulldog (here seen imitating Palin's Newsweek macro shot). When she first sent pictures of him, I thought "WTF?" But when you meet him, well, let's say he had me at "SNORT!"